TASK: Identify additional targets near newly assimilated drones. Pursue. 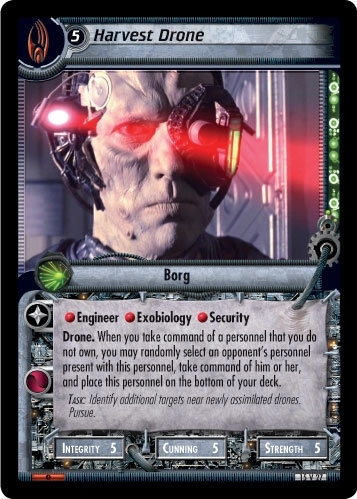 When you take command of a personnel that you do not own, you may randomly select an opponent's personnel present with this personnel, take command of him or her, and place this personnel on the bottom of your deck. This card have been fully converted from 2E into 1E under OTF rules - please use Four of Fifty from Broken Bow instead. "Harvest Drone" is a backward compatible card form the Second Edition expansion The Undiscovered Country - ST1E compatible (by The Continuing Committee). See collectors infos for this card in the Second Edition section under the UCT-ID: ST2E 15 V 27.